This biography is published by the State Electricity of Victoria as a tribute to a great man. It was written by Vernon R. Northwood, with assistance from the late Dr. Gershon Bennett, son-in-law of Sir John Monash, and was first published in the “S.E.C. Magazine” in December 1950. JOHN MONASH was a great man. He was pre-eminent as a scholar, engineer and soldier. His greatness arose from the use he made of the personal qualities with which he was endowed. Gifted with a rare intellect, he possessed a burning desire for knowledge, and boundless energy in his search for it. In all walks of our life when leadership is discussed, the name Monash will be heard. The spheres in which he gave so abundantly to the nation were as a soldier and an engineer. As a soldier he hated the waste and suffering of war, but his brilliant battle strategy paved the way to the final victories of the Allies in France in 1918. His name - as leader of the Australian Forces - is forever perpetuated in the records of the Australian War Memorial in Canberra. To his qualities of planning and leadership the State Electricity Commission of Victoria stands as a permanent monument. His vision went beyond that of most men of the day when he foresaw the potential of our vast brown coal resources in the Latrobe Valley, the development of which was to win independence for Victoria from outside sources of fuel for power generation. John Monash had wide interests throughout his lifetime - classical and operatic music (he played the piano beautifully), reading, debating, sketching, chess, the practice of astronomy, gardening, carpentry, bush walking, even the practice of legerdemain and conjuring - but, far from dissipating his time and talents, these activities served to strengthen and enrich his main endeavours. To future generations who acquire their academic training at our great new seat of learning - Monash University - his name will be a source of inspiration and a constant reminder of a brilliant scholar who in his later years counselled young men to "seek knowledge in all directions for its own sake." An equestrian statue of Monash (unveiled on November 12, 1950) stands in the Melbourne Domain as the State's tribute to one of its truly great men. From an eminence it looks down on to St. Kilda Road, along which each Anzac Day march the dwindling veterans of the First A.I.F. which he commanded—a parade which he himself inaugurated and led in its early years. By night, unseen, his statue commands a view far beyond the parklands towards the glow of a city--a city of light and power—a fulfilment in part of the vision he saw. GENERAL SIR JOHN MONASH was born on 23th June 1865, in Dudley Street, West Melbourne, in one of a terrace of houses overlooking the Flagstaff Hill, so named because one of the earliest Government Houses stood on the hill and on its flagstaff a flag was flown whenever the English mail arrived in port. He was the son of Mr Louis Monash who reached Australia as an immigrant in 1853 when 21 years old. He received his first schooling at St. Stephen's School on Docker's Hill, Richmond. Others who subsequently became well known in public life were also at the school. In the early part of 1874 his parents went to live in New South Wales in the then rather primitive township of Jerilderie and during his three years there he had, as a growing boy, a vividly interesting experience of country life. He learned to ride and also acquired much skill in bushcraft. The teacher at the local school, Mr. William Elliott, took a personal interest in him and taught him many things outside the school curriculum, such as higher mathematics and so on. So impressed was his teacher that he strongly urged the boy's parents to take him back to Melbourne. Mrs. Monash resumed residence in Melbourne with her three children towards the end of 1877 and John Monash was sent to Scotch College. He remained there until 1881, in which year he was equal Dux of the School, Dux in Mathematics and Modern Languages, and gained a Matriculation Exhibition in Mathematics. The following year, when 16 years of age, he commenced his career at Melbourne University, entering the faculty of Arts with the ultimate purpose of becoming a civil engineer. The whole of the time he was at the University he was handicapped through lack of funds and he did much coaching of students for matriculation in order to pay his way. In those days there were a number of other young men similarly situated who afterwards became distinguished in public life. From his diary it would seem that his first year at University was an amazingly full one. He seems to have spent his time reading every conceivable book, ancient and modern, of any real worth that he could get his hands on. The reading was mostly done either at the Melbourne Public Library or the University Library. He had regular painting lessons, attended the Supreme Court to hear legal arguments and the Houses of Parliament to listen to debates, did carpentry as a hobby, wrote articles and letters to newspapers, belonged to debating societies, wrote essays on many and varied subjects, played the piano for long periods and interspersed all this with short bursts of attending lectures and preparing his work. The second year seems to have followed a similar pattern of activity and he also played much chess, spent innumerable hours watching dredges at work and buildings being erected, and he seems to have walked all over Melbourne to watch all forms of constructional work. In 1884 he was compelled to suspend his University studies to earn his livelihood and at the age of 19 he took an appointment on the construction works of the new Princes Bridge, which were then just starting. In the following two years he advanced his position on the works, ultimately being given charge of the whole of the earth works, both on the shore and in the river bed, and the whole of the masonry. In 1886 and 1887 the firm for whom he was working (David Munro and Co.) employed him on other important bridge works in Melbourne. During this period the Victorian Militia was formed out of the volunteer force which was disbanded, and in 1884 John Monash joined the University Company of the Victorian Rifles. He rose steadily through the ranks and was appointed Color-Sergeant in 1886. In the following year, after the University Company had been disbanded he applied for and obtained a commission in the Militia Garrison Artillery. The following entry in his diary at this time is of significance: "The undercurrent of my thoughts has been running strongly on military matters. Yesterday things came to a finality. I have been attached to Major Gold-stein's battery with the prospect of appointment before Easter; a combination of military and engineering professions is a possibility that is before me." Early in 1887 he was employed by another firm of contractors to take charge, at the age of 22, of the construction works of the Outer Circle Railway which extended from Fairfield Park to Oakleigh. It was during this period that he was able to finish his University studies and to take out the degree of Bachelor of Civil Engineering. In 1891 he married Victoria Moss, the daughter of Moton Moss, a well-known early colonist. Finding that acquaintance with legal principles was very valuable to an engineer, he decided to qualify in law and in x895 he obtained the degrees of B.A. and LL.B. He had already been admitted to the degree of Master of Civil Engineering at Melbourne University in 1893. About this time the historic land boom burst and the young engineer was again thrown upon meagre resources, but he received an appointment as Assistant Engineer and Chief Draftsman of the Melbourne Harbor Trust. During this period he further qualified as Municipal Surveyor, as Engineer for Water Supply and as Patent Attorney. Owing to the aftermath of the boom he was compelled to relinquish his position with the Melbourne Harbor Trust in 1894. His answer to this situation was typical — he entered private practice as a Consulting Engineer and Patent Attorney—a practice which continued for 20 years. His professional standing rapidly improved and he received many engagements in other States, some of these being in connection with the construction of the railway from Bundaberg to Gladstone in Queensland, the Mullewa to Cue railway in Western Australia, the Kelly Basin to Gormanston railway in Tasmania, and he designed the King River railway bridge in north western Tasmania. As an expert witness in the law courts he was much sought after and he figured in a large number of celebrated cases, some of which went to the Privy Council in London and were decided largely on his evidence. The public career of this brilliant engineer and soldier fell mainly into three phases. The first, his rise to prominence as a civil engineer prior to 1914; the second, and most spectacular, his appointment, with the rank of Lieutenant-General, to command the Australian Army Corps in the first World War; and the third, the culmination of his career, his service to the people of Victoria as Chairman of the State Electricity Commission from its earliest years for ten years until his death in 1931. IT WAS IN 1896 that he took up reinforced concrete as an engineering specialty. As a partner in. the firm of Monash and Anderson, Consulting Civil, Hydraulic and Mechanical Engineers and Surveyors, he designed the Morell Bridge — commonly referred to as the "Anderson Street Bridge"—over the Yarra River near the Botanical Gardens. The bridge, known as a "monier arch" bridge, consists of three spans each too feet long. This was the forerunner of a very large and extensive practice in bridge building and general engineering construction (mainly in reinforced concrete) which extended beyond Victoria into South Australia and Tasmania. He often declared that reinforced concrete construction was an accepted method of building in Australia long before it was generally employed in Great Britain or in the United States. About the year 1900 he floated his affairs into a proprietary company with David Mitchell (the father of Dame Nellie Melba) as Chairman of Directors, and this was for him a period of great prosperity. During the whole of the years from his University days in 1884 until 1914, John Monash steadily applied himself to soldiering. He gradually obtained military promotion and became well known as a lecturer on technical military subjects. About 1912 he was asked by the Hon. J. W. McCay (later Lieutenant-General the Hon. Sir James McCay) to become associated with the newly-formed Intelligence Corps, and he took up command of the Victorian section of this, with the rank of Lieutenant-Colonel. In 1913, he was offered and accepted the command, with the rank of Colonel, of the 13th Infantry Brigade in Victoria, comprising five battalions, including two battalions attached for training. He held this command on the occasion, early in 1914, when General Sir Ian Hamilton, as Inspector-General of the British Overseas Forces, visited Australia. In his presence in January 1914 John Monash, as Brigade Commander, conducted extensive tactical exercises with troops, and the favourable report which General Hamilton made on this work contributed largely to the selection of Monash for a command in the A.I.F. In 1912 he had become President of the Victorian Institute of Engineers, and later was elected a Full Member of the Institution of Civil Engineers, London. In 1910 he had been on an extended world tour, accompanied by his wife and daughter, and after several months spent in Germany he came away convinced that war with Great Britain could not be long deferred. About the middle of 1914, he was acting on the Australian Executive to arrange for the Australasian Meeting of the British Association for the Advancement of Science. War broke out as several shiploads of the visiting scientists were landing in Australia. 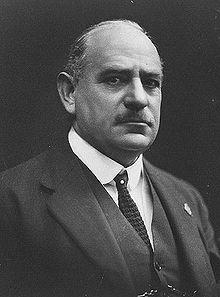 Many of them were foreign and John Monash in his position as Chief Censor had the unpleasant task of interning a number of German scientists whom the executive, of which he was a member, had invited to Australia. WHEN THE DECLARATION of war came it found him with the rank of Colonel in a citizen force unit—the militia colonel, as he was once described by an admirer, who was destined to teach the generals of the world how to wage war. He planned every movement of his forces with the genius and detail of a great organiser. His mind was eminently one for methodical and cool deliberation but his success did not depend on perfection of plans alone. There was a dynamic quality in him that made him seek decisions. He became one of the greatest leaders in the war but this distinction was not attained without unending hard work. In December 1914, as Colonel Monash, he left Australia in command of the 4th Infantry Brigade. He landed on Gallipoli in command of this brigade and his leadership there was stamped by method and cool deliberation—characteristics which were later to win him fame in France. He was promoted to the rank of Brigadier-General and later supervised the evacuation of his Brigade from the Peninsula. After a period in Egypt and on defence in the canal zone, his Brigade moved to France in June 1916. In July 1916 came promotion when he was summoned to England to organise and train the Third Australian Division and, before the end of November, Major-General Monash was in command of this Division in France, holding the Armentieres sector. The Division took a leading part in the battle of Messines in 1917 and it continued to occupy vital parts of the Allied front line. His moral courage and his readiness to accept responsibility were tested to the full when, resting in the south of France in March 1918, he learned that the Germans had broken through on the front occupied by Gough's Fifth Army and were pouring through the gap towards Amiens. He was given the task of holding the Germans between the Ancre and the Somme. Working day and night, he gathered the battalions together by motor bus and by train, and deployed them across the path of the advancing enemy. Gradually the attacking waves spent themselves against Monash's forces and the situation was saved for the Allies. When a couple of months later General Sir William Birchwood was given command of one of the British Armies there was hardly any question as to who should step into his shoes in the Australian Corps. Not only had General Monash proved his tactical ability, but he had also won the confidence of the troops in the field. In June 1918 he was promoted to the rank of Lieutenant-General and given command of all five divisions of the Australian Army Corps. To it were added at various times a British Division, two Canadian and two American divisions, General Monash thus becoming the first British General to have had United States troops under his command. In the closing days of September 1918 his command numbered 208,000 men. The successful action at Hamel in July 1918 marked the turning of the tide. General Monash's orders and battle-plans for this operation were so brilliantly conceived and so superbly carried out that they were republished by British General Headquarters as a model in order-writing for the whole British Army. "A perfect battle-plan," Monash once said "is like nothing so much as the score for an orchestral composition, where the various arms and units arc the instruments, and the tasks they perform are their respective musical phrases. Every individual unit must make its entry precisely at the proper moment and play its phrase in the general harmony,"
The Australian offensive of 8th August, "Ludendorff's Black Day," was the beginning of the end. From then on the Australian Army Corps was continuously active delivering a succession of shattering blows that did not cease till the Hindenburg Line had been stormed and the German forces were in full retreat. At Bertangles, near Amiens, on 12th August 1918, four days after the offensive began, General Monash received the accolade of knighthood from His Majesty King George V, the first British sovereign to confer a knighthood on the field of battle since King George II created knights at the Battle of Dettingen in 1743. This may have given him right to the long-dormant status of "Knight Banneret". General Sir John Monash's summing up of war and the future is worthy of note. At the end of the Great War he wrote: "From the far off days of 1914, when the first call came, until the last shot was fired, every day was filled with loathing, horror and distress. I deplored all the time the loss of precious life, and the waste of human effort. Nothing could have been more repugnant to me than the realisation of the dreadful inefficiency of, and the misspent energy of war. Yet it had to be, and the thought always uppermost was the earnest prayer that Australia might for ever be spared such at horror on her own soil. There is, in my belief, only one way to realise such a prayer. The nation that wishes to defend its land and its honour must spare no effort, refuse no sacrifice to make itself so formidable that no enemy will dare to assail it." OR the signing of the Armistice, General Sir John Monash undertook the enormous task of demobilising the A.I.F. During 1919 he took part in many activities in London, including the three great marches through the City – the Anzac Day March, the Dominions March and the Peace March. He had several audiences with His Majesty King George V and also lunched with him informally. He returned to Australia, reaching Melbourne on Boxing Day 1919. In 1920, Sir John Monash returned to his private business affairs. During this period he was asked by the Commonwealth Government to act on a committee of senior officers to lay down a policy for the future Commonwealth Defence, and also became a member of the Commonwealth Council of Defence. IN OCTOBER 1920, he was invited by the State Government of Victoria to become General Manager of the State Electricity Scheme—which under the original Electricity Commissioners was then in the formative stages—with a view to a further appointment as Chairman of the Commission as soon as legislation for its creation could be prepared. He assumed office as Chairman of the State Electricity Commission early in 1921. When Sir John Monash took over the direction of the Electricity Commission in 1920 he was 55 and at the zenith of his mental powers. His liberal education had been augmented by wide and most successful experience in the direction of civil and military operations and his prestige was such as to command the confidence which enabled his plans to be carried out without question. He undertook his work with the Commission with the deliberate intention or rendering further public service to the nation. When he began, the duties of office had exceeded what his predecessor (Sir Thomas Lyle—first Chairman of Commissioners and a Commissioner until January 1937) and the other part-time Commissioners could reasonably be expected to undertake. Sir John Monash threw himself into his task with characteristic energy. In 192o the first of the tenders for the erection of the Yallourn power house had been received and accepted. Thereafter the development of Yallourn became one of the romances of engineering in Australia. In 1921 the first sod was turned preparatory to removing the overburden and clearing the coal face at Yallourn. The building of the power house proceeded steadily, a track more than 120 miles long was cut through the forests of Gippsland to Melbourne and the transmission line put through, and in 1924 the first of the electricity from Yallourn was received in the city. In the meantime, however, Sir John Monash had discovered that an industrial crisis would occur if the metropolis had to wait until 1924 for power from Yallourn. Accordingly, by agreement with the Railways Department and the Government, he arranged for an extension of the Newport railways power house expressly for industrial and domestic supply. As a result of the rapidity with which this equipment was provided a severe check to the industrial development of the city was avoided. Sir John Monash saw more of his plans reach fruition—the extension of the first power house and the partial erection of another power house at Yallourn half as large again as the first. He had also arranged for the erection of a group of hydroelectric stations in the Rubicon district. As an engineer Sir John Monash was quick to recognise that in its brown coal deposits Victoria possessed an asset the value of which would be by no means confined to the development of electrical power. He set himself to the task of finding other purposes for its use, and an experimental briquette factory was built at Yallourn. The new fuel proved very popular and from this beginning came the manufacture of briquettes on a commercial scale. In the last year of his life came the final honour to Sir John Monash when he was appointed to represent the Commonwealth of Australia at the opening of New Delhi, India, where he unveiled the Australian Commonwealth Column. Sir John Monash was frequently called upon in the years after the war to act in public matters of importance. When a Royal Commission was appointed to enquire into the circumstances of the police strike of 1923, he was made Chairman. On several occasions he acted for the Commonwealth Government, as, for instance, in the dispute between the Naval Board and the Shipping Board as to the building of Australia's two cruisers. He initiated and developed the Anzac Day ceremonies in Melbourne and took a prominent part in connection with the erection of Victoria's national war memorial, the Shrine of Remembrance, being one of the assessors who selected the accepted design. He was also much in request as a public speaker. Both before and after the war he wrote many papers on engineering subjects. His book, "The Australian Victories in France in 1918," was submitted by him to the University of Melbourne in 1920 as a thesis upon the subject of engineering applied to warfare and on it he was awarded the degree of Doctor of Engineering, being the first to receive that degree at any Australian University. The diversity of Sir John Monash's interests was astounding. He had graduated in arts, law and engineering and had a considerable knowledge of medicine. Books of travel, biographies, poems, plays and fiction all came alike to him and were eagerly devoured. He was a good German linguist and had a working knowledge of French. He was an enthusiastic gardener. He took up astronomy and spent many hours with his telescope erected on a platform in his garden. In his later years he did little painting but continued to sketch until the end of his life. He was interested, peculiarly enough, in all forms of legerdemain and conjuring, and many a child remembers happy hours spent watching his performances, though they were never of a very high order. In his earlier years he climbed many a peak on our mountain ranges but in later years he was content to walk with the Wallaby Club through the bush admiring the Australian landscape which he loved. But his greatest solace was music; he was an accomplished pianist and on one occasion, in his youth, performed at a concert in the Melbourne Town Hall. He loved classical music, and he attended concerts and operas performed in Melbourne for many years. From music he seemed to emerge like a giant refreshed to deal with the workaday world. An outstanding trait was the method he employed so that all references should be ready to his hand. His whole immense library was catalogued. He kept a record properly filed and indexed of letters he wrote and received from the age of seven until his death. One who knew him intimately has said: "The characteristics which I will always recall were his love of children, his simplicity and his gentleness—for his was the gentlest soul I have ever known. This man was very human, and, therefore, not without fault, but these qualities of which I speak, a humanity which could find expression in an overwhelming gentleness, placed him amongst those who light a beacon fire for us poor mortals to look up to." ON THE DEATH of Sir John Monash on 8th October, 1931, after a short illness, the whole nation mourned. He was accorded a State funeral and the body lay in state in Queen's Hall at Parliament House. The entire route of the funeral procession from there to Brighton Cemetery was lined by citizens paying their last respects. The feelings of all within the Commission were expressed by one of its senior officers who wrote: "The whole of the employees of the Commission looked upon him not only with pride as their leader but with affection as a very kind personality and his untiring and self-sacrificing devotion to duty will be a lasting inspiration to them and to their fellow citizens whom he served so well." The nation had lost a great man. The Commission in particular had lost a great leader and it recorded: "First as General Manager, and then as Chairman, the Commission had the full benefit of his genius and prestige; and Victoria's national scheme of brown coal development and electricity supply is, and will be regarded always as, a monument to his capacity for organisation and administration, his amazing industry, and his zeal for the public welfare and the advancement of the State. Great even in small things, and pre-eminent in great things, Sir John Monash left behind him a record alike distinguished as a leader in peace and war,"
THE SHIELD — The five stars are a conventional representation of the Southern Cross, indicating Australian nativity. The broad gold band across the centre of the Shield is, in Heraldry, a "Fess", and represents a Bridge, symbolic of Engineering. The sword represents War, and means that the original holder was a soldier. The Laurel Wreath represents Learning or Academic Rank. It is also the Laurel Wreath of the Victor. THE CREST — The Lion is the Lion of Judah, and denotes Jewish origin, The Lion is holding the Compasses of Solomon, which represent a Builder. THE MOTTO — Is in Latin to indicate Learning, It means "For War and Art," indicating that the holder of the Grant has devoted his life to the Arts both of War and Peace. THE SUPPORTERS — Arc an Artilleryman and an Infantryman of the A.I.F., denoting that the honour of Knighthood was granted to the holder as the leader and representative Of the soldiers of Australia. THE BAND OR GARTER — This surrounds the Shield, and is indicative of the gold Collar worn by Knights Grand Cross of all Orders on State occasions. In this case it is the gold Collar of the Order of St. Michael and St. George. THE BADGES — The various decorations granted to the Knight are represented as hanging from the Scroll of the Motto, and are here, respectively, from left to right: The French Croix de Guerre; The Belgian Order of the Crown; The Badge of a Knight Commander of the Bath; The Badge of a Knight Grand Cross of St. Michael and St, George; The Legion of Honour; The American Medal for Distinguished Service; and the Belgian Croix de Guerre. Chairman, State Electricity Commission of Victoria. Knight Grand Cross (Military Division) of the Most Distinguished Order of St. Michael and St. George. Knight Commander (Military Division) of the Most Honourable Order of the Bath. Colonial Auxiliary Forces Officers' Decoration. Mentioned in Despatches, eight times. Grand Officier de la Legion d'Honneur, French Republic. Grand Officier de l'Ordre de la Couronne, Belgium. French Croix de Guerre, with two palms. Director-General of Repatriation and Demobilisation, 1919. Bachelor of Arts, University of Melbourne. Doctor of Laws, University of Melbourne. Doctor of Engineering, University of Melbourne. Fellow of the Institute of Patent Attorneys, Australia. Doctor of Civil Law, University of Oxford. Doctor of Laws, University of Cambridge. Member of the Melbourne University Council. Member, Victorian Selection Committee Rhodes Scholarship. Vice-Chancellor of the Melbourne University. Honorary Colonel, Melbourne University Rifles. Member of the Institution of Civil Engineers, London. Member of the Institution of Engineers, Australia. President Victorian Institute of Engineers. Vice-President of the Australian National Research Council. Memorial Medal of the Institution of Engineers, Australia. Recipient of the 1930 award of the Kernot Memorial Medal. Honorary Fellow of the Royal Victorian Institute of Architects. Member of the Australian Council of Defence. Chairman of the Anzac Day Commemoration Council, Victoria. Deputy Chairman, National War Memorial Committee of Victoria. Member of the Board of the Walter and Eliza Hall Institute. President of the Victorian Naval and Military Club.